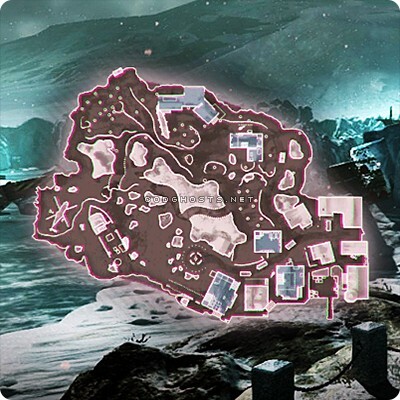 In Call of Duty: Ghosts there is a map called “Whiteout” and within that map I often wander. I roam the map in solitude because despite always coming to this map in order to play team-based activities, I never manage to play team-based activities. The west of the map is dominated by a series of hills and tunnels, multiple tiers hidden by their clustered design; underneath those hills and tunnels, between the cliffs and the sea there are ruined ships. Beyond those ships, to the southeast, there’s a village that comprises that area and most of the eastern part of the map. To the north, there is a ski lodge and a sawmill, and between those two locations and the cliffs, most of the deaths on the map occur. I don’t stay there. I push out from the spawn location, where my team pushes and shoves in order to sprint to the front line to die in droves a little bit slower than the other team so that we can “win” in this arbitrary horrorshow. I walk away from my team members. I stand in the village. Skulls pop up on my screen. They show through the scenery, the models, the level design. They appear through everything. I stand in this serene and confusing small world in a bigger more confusing world designed to call players into lanes of murder and the world becomes understandable to me because of those murders. Death makes meaning out of my act of wandering away from the arcade loop of react and respawn. I see the shape of the world through the loss of their lives. Between ski lodge and ice canyon they walk into gunfire from accurately modeled rifles, and I watch those wasted lives become iconic and render the world sensible. And then I am there too. This entry was posted in Video Games and tagged call of duty: ghosts, death, language, video games. Bookmark the permalink.